No theme today for MTM, so we came up with a swamp theme. 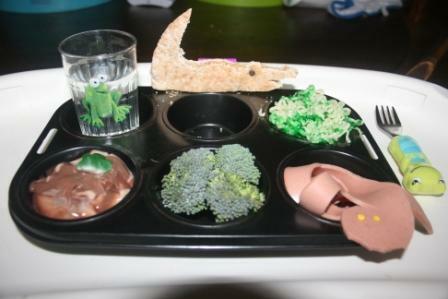 Swamp water, alligator peanut butter sandwich, green spanish moss Ramen, boggy chocolate pudding with a gummy frog, mossy broccoli, and snake bologna. Hey, wanna see how our chickens sleep? You've been wondering, haven't you? I'm still working up the nerve to inform Paul that he's going to have to extend the lower deck so there will be room next to Elvis for Wendiwinn if she comes to visit. I love the swamp theme. The frog in the glass is priceless. 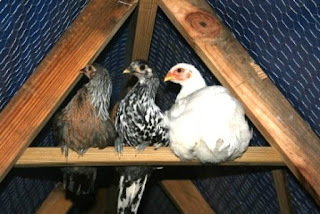 LOVE the chicky pics. 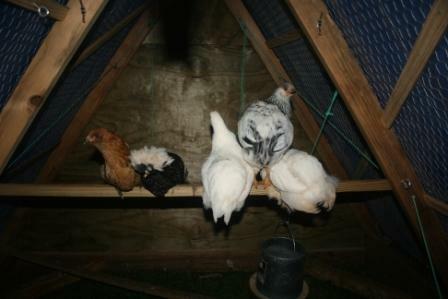 They look rather comfy! I don't think in a million years I would have thought to do swamp theme! I really like it, so clever. That is so clever, really imaginative! Very creative theme, it turned out great! Wow! I love it all - especially the alligator! By boy would love a swamp lunch! Great tin! I want to do more lively themes but Audrey still turns her nose up at different things. Great idea! Maybe someday soon I can do something similar. first. i'm honored that you'd create room for me next to elvis. second. i'm sleeping in the main house.